Fire up a feast with this portable, grill-side case of stainless steel utensils. 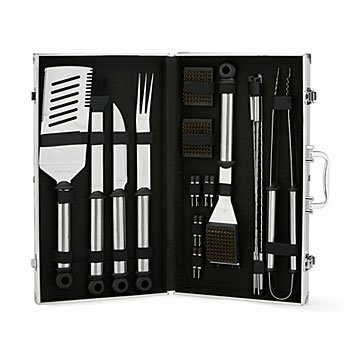 Fire up a feast with this portable, grill-side case of stainless steel utensils topped with heat-resistant handles. Perfect for the on-the-go grill master, this traveling case transforms day trips, parks and backyards with its fully-equipped set of flame-retardant cooking tools. Whether you're flipping kabobs or charring fresh corn, you'll always have the right tool for the job. It's outdoor entertaining in a two snaps of its case. Made in China. The outer design of the briefcase may vary. Tools are dishwasher safe. Spot clean and air dry case. Plastic on handles is Polypropylene and heat resistant up to 212 Degrees Fahrenheit, however, the utensils are not meant to sit on the grill. He loved the style and it looks quite sleek and professional. Will complement his NEW gas/charcoal/smoker grill.... can't wait to see him in motion with the new set-up! My husbadn loved this grill set as a gift. However when he went to use the skewers, the plastic handles melted! If it can't handle fire it should NOT be used for grilling. Sad because it looked high quality. Bad materials. The rest of the items seem to be fine but we aren't trying the other pieces that have plastic on them. My husband hasnt used it yet, but has been showing it off to his friends. Although it was a Fathers Day gift which was received after the 4th of July 2016, because of his excitement over the BBQ BRIEFCASE all is forgiven. Great product, perfect gift for my father who is an avid griller. He can use it at the house or pack it up and take it camping or pretty much anywhere. Seems like it is good quality. I love that the tools are in one portable place. Great looking case!! It was a Christmas gift for my husband and he kids were all guessing what was inside such a cool case. Shocked is the best description of the look on his face when opening this suitcase which he assumed was for CDs . very well made , impressed it came with corn ears . This is a beginning review since I just gave the BBQ Briefcase to my dad for Christmas - he really liked it and is looking forward to using all of the tools. Unable to talk about the durability or use as it hasn't been used yet but it looks great and the case is very sturdy. This is a quality product with an impressive appearance. It is compact and great for home, camping or RVing uses. My husband was thrilled with this gift. Beautiful and useful gift for home, picnics with family or friends. Farther was really surprised and loved it. And Case is gorgeous! Looks great and durable !